Perla Batalla in The House of Cohen reveals the timelessness of Leonard Cohen’s music. Batalla’s signature cross-cultural style conveys her sincere respect and deep love for the music, poetry and most of all her dear friend, Leonard Cohen. 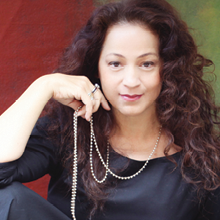 World-class vocalist Perla Batalla is a full-throated songstress who has worked with Leonard Cohen, k.d. lang, Nick Cave and Laurie Anderson.